Does one have to make a choice between ideological purity and success as an economist? Many free-market economists believe that one has to choose one or the other. Murray Rothbard (1926–1995) held views on economics and government far outside the accepted mainstream. Nevertheless he was extremely prolific in both mainstream and non-mainstream outlets and his work has influenced many people. 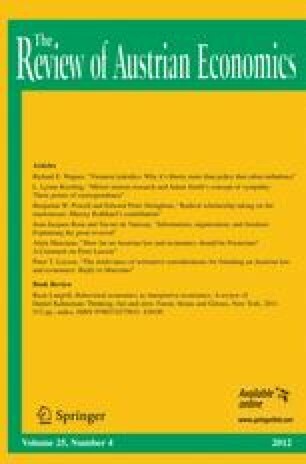 This article surveys Rothbard’s contributions to top ranked economics journals and discusses some of the attention his work received in those journals and elsewhere. Rothbard left a bold and uncompromising research program in political economy that has inspired many to follow. The authors would like to thank Jeffrey Rogers Hummel for sharing all his knowledge on this subject. The authors have also benefited from conversations with Walter Block, Peter Boettke, Bill Evers, Walter Grinder, Leonard Liggio, and Jarret Wollstein.